After a few days in “the city,” I headed upstate, familiar territory for me! It’s a four-hour drive to Ithaca College (where I taught Literature for over a decade), a small but not too small school: approximately 6,000 undergrads, with particularly notable reputations in Communication, Performing Arts, and Business/Marketing. I never met a faculty member there I didn’t like, and many students have close relationships with their teachers. The campus environment is politically liberal, and the town has a lively cultural scene. Ithaca is Gorges, the bumper sticker says, referring to the town’s natural beauty—big, beautiful Seneca Lake, rolling hills and, of course, the dozen or so gorges in the area. Over on Ithaca’s other hill is IC’s Ivy League Sister, Cornell University. (There is reciprocity between the two, so that students at one campus can take classes at the other.) Cornell’s undergrad population is more than twice the size (13,500), but still offering a good faculty to student ratio (9:1). That said, as an internationally renowned research institution, Cornell is a place where freshman and sophomores don’t get much personal contact with professors; teaching assistants meet with and grade student work. The range of majors—80, in all—is huge, including such highly specific ones such as Fiber Science and Apparel Design. 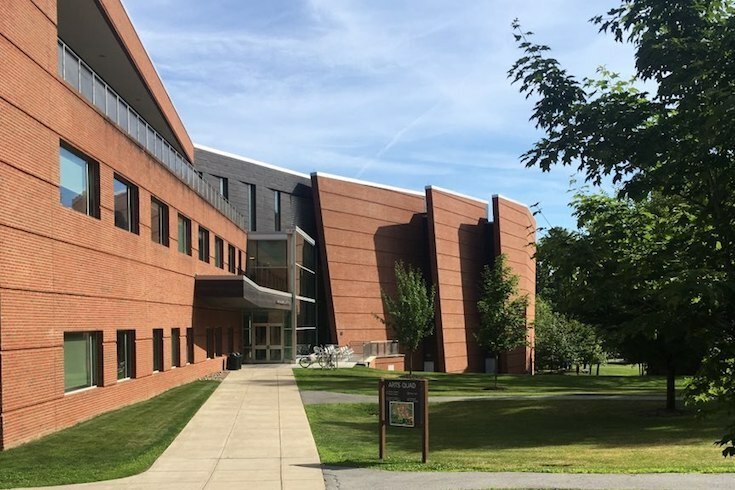 About three hours north of Ithaca is Skidmore College, in the beautiful town of Saratoga Springs–known for its summer season of horse-racing, as well as music and theatre festivals. I’d never been to Skidmore, and I was pretty wowed by its variety of programs and opportunities for a small (2,500) school. It struck me as a great fit for many of our students. The welcome I received there was remarkable; as you can see from the photo, several tour guides hung out with me, talking about their experience. Skidmore is less selective than Cornell, more selective than Ithaca, and diverse in terms of majors and student interests. The young men and women I spoke to stressed that they all felt they could “be themselves” without judgement. Skidmore is close to Albany, where there are myriad internship opportunities. The majority of students double major, and it was voted 7th most entrepreneurial school in the country. So, SNOW. Yes, this is deserving of its own paragraph, albeit a small one. Upstate New York schools are knee-deep in the stuff from the middle of November to the end of February. Snow is fun, as are skiing and sledding! It’s also cold. For a student not used to it, some adjusting is necessary. For most people, the environment and weather of one’s college years do matter; so it’s worth visiting during winter months to see how you feel in the face of the white stuff. On a final note, these schools are in relatively small towns, and getting to a metropolis isn’t a short drive. Cons: For the student used to easy access to urban energy, there may be times where the environs feel “slow and steady,” rather than “fast and frenetic.” Pros: Community on-campus is strong and lively, and there are few distractions. Next stops: Bennington, Bard, Landmark, and Sarah Lawrence.